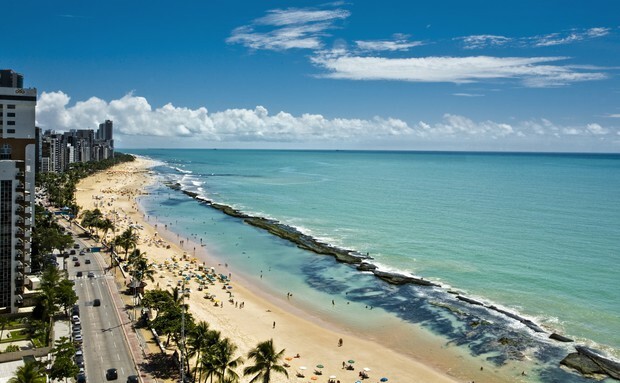 Once a fisherman's village, Recife is now a star that shines over waters far beyond its historic harbor where two rivers flow into the Atlantic Ocean after passing by mangroves that form one of the largest urban estuary systems in the world. The city is nicknamed The Brazilian Venice by virtue of its waters, while its formal name comes from coral reefs that run along the shoreline, shaping miles of seashore into natural pools and creating one of the prettiest beach areas in Brazil. Cosmopolitan Recife, where colonial architecture coexists with modern splendor, is the hub of northeast Brazil for excellent art, dining, trade, and education. No visit to Recife would be complete without a stroll through the hills of neighboring Olinda. Built in the early 1500's, charming Olinda is one of the largest and best-preserved Portuguese colonial towns, and was designated a world heritage site by UNESCO (United Nations Educational, Scientific, and Cultural Organization). A living city full of art shops and galleries, ornate churches and monasteries, museums, cobblestone streets and shady squares, Olinda always has some kind of celebration in the making. Both Recife and Olinda offer exceptional topside touring as well as a rare diving adventure, all with a sense of history. Over the years there came to be more than 100 shipwrecks off the coast of the cities, 17 of which are now regularly visited in warm and crystal clear waters. These war galleons, steamships, tugs and barges date from 1652 to 1986 and offer a wreck diving experience that is a treasure not to be missed. Countless species of fish and corals will dazzle the senses, aided by excellent visibility and an average water temperature of 78 degrees Fahrenheit. As you make your way through these sites you will see some of Brazil's favorite shores between the surfing and snorkeling of Porto de Galinhas, and the sailing and power boating around the islands of Coroa do Avião and Itamaracá. The steamship was hit by Pirapama in 1887. It is sunken 12 miles from the island of Itamaracá in one of the best diving spots in Brazil.Down under 85 feet of clear water there is a great variety life, including rays, turtles and a couple of species of man-sized fish. The area is also home range to manatees that have engendered one of Brazil's most famous environmental study and protection efforts. The view of Fort Orange, which was site of countless battles between Dutch and Portuguese colonists is well worth a run aground. Two years after the collision with Vapor Bahia, the ship was sunk after being found guilty of having caused the accident and neglected to render proper rescue. Sitting six miles from the Recife harbor at 75 feet, the wreckage is now home to several marine species, including large turtles and rays. The visibility can reach as far as 131 feet in this beautiful and popular dive. The steamship is believed to have been hit by a torpedo. It certainly has aged gracefully at 69 feet. The ship still exhibits the vast collection of china and porcelain artifacts it carried with its wheels, which are now covered by beautiful corals. It stands 5 miles from the Recife harbor closest of all wrecks to the Five-Edged Fort that was the main protection post of the city. The edifice and the nearby mangroves deserve a trip up river behind the reefs. The historic Portuguese warship sunk in 1652 (during colonial wars with the Dutch) seats at 39 feet only 3 miles from a cape that is also remarkable. Besides being beautiful, Cabo de Sto. Agostinho is the second easternmost land in the Americas and hosts the ruins of one of the hemisphere's oldest forts, from where the cannon balls that sank Galeão São Paulo were shot. The riches in the ship were looted by pirates, but the part that was recovered is on display in a museum in Recife (Museu do Recife). In addition to dolphins and lots of different fish and coral species, the ship's iron and bronze cannons, anchors and central mast can still be seen. Airport from all major Brazilian cities.